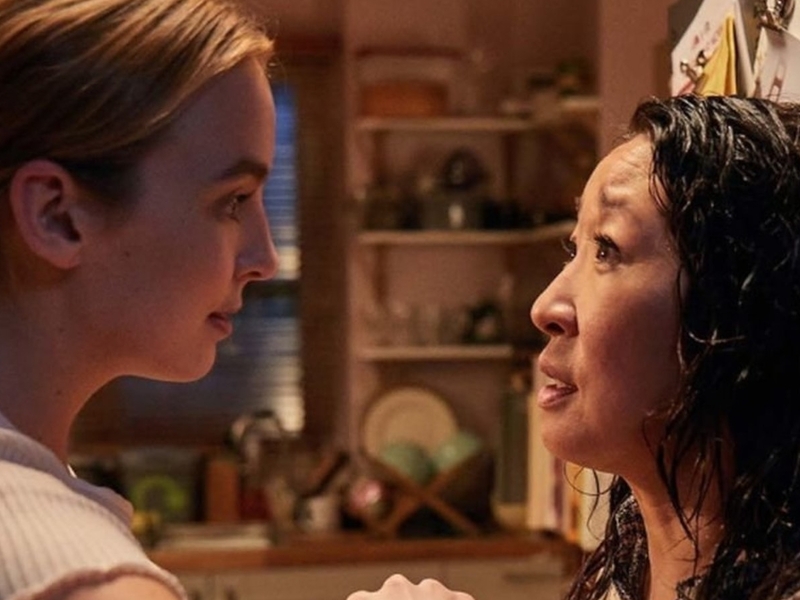 Killing Eve has a cat-and-mouse-chase premise that is similar to that of many other shows, but that’s the only familiar thing about it. In every other respect, it’s absolutely revolutionary. Anyone who’s seen Killing Eve can agree that the show is one of the best crime dramas of recent times and definitely the most unique one of them all. Following a detective on the hunt for a dangerous assassin, at first glance it might not be an unusual story: but it soon becomes clear that it’s wildly different from anything we’ve ever seen before. From the very beginning, the story dares to do something we haven’t seen before in detective vs. criminal crime dramas: it made both the detective and the criminal be women. This forces some powerful changes to a premise that could otherwise easily fall into a familiar pattern of tropes. Whereas the relationship between Eve and Villanelle is beginning to turn into something reminiscent of Clarice and Hannibal Lecter in Silence of the Lambs — mutual intellectual fascination, a touch of attraction, a lot of fear — there’s a significant difference in the power dynamics that happens when both characters are of the same gender. Villanelle and Eve more easily see each other as equals, and the sensual relationship developing between them seems less predatory than it might have seemed were Villanelle a man. Also, Villanelle is younger than Eve, although the most dangerous of the two. This also allows for more open-minded writing. Far from submitting to the usual brooding-detective trope, Killing Eve sets up its main character as a strong, ambitious yet ultimately level-headed woman. She has a relatable and witty sense of humor that removes the need for a secondary character to provide comic relief; she’s childless, has a husband and friends outside of work, and isn’t really haunted by much other than the intellectual challenge posed by Villanelle’s killing spree. Eve doesn’t set out to find Villanelle because of some terrible, crushing experience: it’s out of genuine fascination. And Villanelle herself isn’t a misunderstood villain. She loves her job and doesn’t plan to stop doing it anytime soon. She’s a villain, and both she and Eve know it. The threat Villanelle poses to Eve, then, is a lot less predictable. She has no children for Villanelle to threaten, and her relationship with her husband is rocky and not of particular interest to her enemy. Villanelle is strong and capable, but also younger and not a visibly physical threat. There is no threat of sexual violence of any kind. This puts our fear of Villanelle — and Eve’s own fear of her — in a confusing place. We don’t know what to expect. There aren’t really any familiar roads this story could follow. This is a show where two very skilled women face each other as opponents, but feel a powerful intellectual — and even physical — admiration for each other. There’s a kind of playful fascination to their interactions that turns the chase on its head and makes it something brand new and exciting. And beyond the plot, Killing Eve doesn’t allow itself to become bogged down by the genre. It inserts colorful backgrounds, daring outfits, and lingers cinematically on the colors and textures of food. It gives us jokes that break the tension. It gives us practical chases and practical women with a dash of glamour and melodrama, which somehow works perfectly. Killing Eve isn’t here to show us the story of a brooding detective haunted by his past, in search of a particularly terrifying murderer: it’s here to tell us the story of a chase between two exceptional yet realistic women. And in a genre oversaturated with tropes and often more occupied on the grizzly, that freshness makes Killing Eve absolutely revolutionary.